Filipinos are a tough bunch. Adaptive to change but resilient to adversities. Each and every Filipino has only one dream - a better life for their family. In the 70s, Filipinos left the country mainly as immigrants. Opportunities to live abroad were abundant and the direction of migration was towards the "Land of Milk and Honey" - the United States of America. My best friend-cousin Ramon and his family left to live in Chicago in 1973. Two of my aunts and their families also migrated to the United States in the 70s. I rarely got to see my cousins again. In the 80s, the Middle East opened its doors to migrant workers. A hefty salary with a 3-5 years work contract. Ordinary Filipinos grabbed the opportunity. They would never earn that much working here. Another great migration was initiated. We saw our engineers, architects, skilled craftsmen, and doctors leave for "a better future" for their families. It was at this same time that Japan started recognizing the Filipino's skill in the entertainment industry. In the 90s, we saw the opportunity to work abroad as nannies, nurse aides and caregivers. North America Europe, Hong Kong and Taiwan started hiring Filipinos to fill in their need for these jobs. Who would not grab this opportunity to go abroad and work a simple babysitting job? It was at this time that the country lost most of our teachers, nurses, and government workers. One day's salary working abroad could equate to half a month's pay if they stayed in the Philippines. And so they packed their bags and left. In the late 90s to mid 2000s, came the Great Nursing Migration. 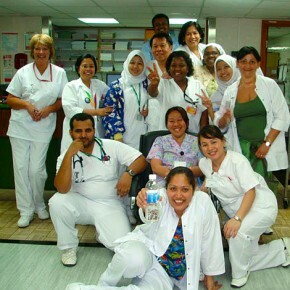 Our nurses flocked to recruitment agencies in the hope of being hired to practice their profession in the United States and Europe. Their families emptied out their savings accounts to pay for their child's licensure exams - TOEFL, TSE, CGFNS, State Boards. All these sacrifices in exchange for earning those precious dollars abroad, in the hope for a better brighter future for the entire family. I saw another beloved cousin of mine leave the country to work as a nurse in the United States. Mid-2000s, Singapore was the destination of choice. Our computer engineers, call center workers, mid-managers and businessmen landed various high paying jobs in Singapore. The need for a workforce fluent in English made the Filipino a perfect fit. I had friends in the industry who opted to leave their family to live and work in Singapore. This is only discussing about land based workers. 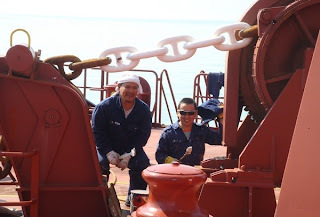 I haven't mentioned the Filipino seafarers. Our brothers who work in cargo vessels, oil tankers, and cruise ships. They too, are significant in number. The endless migrant flow of Filipinos has caused a shift in our workforce. If you could randomly ask a normal high school student what they want to do after college, the most common response would be "to work abroad." According to the Commission on Filipinos Overseas, there are a total of 10.47 million Filipinos working in 217 countries and territories worldwide, representing roughly 25.4% of the entire country's labor force. 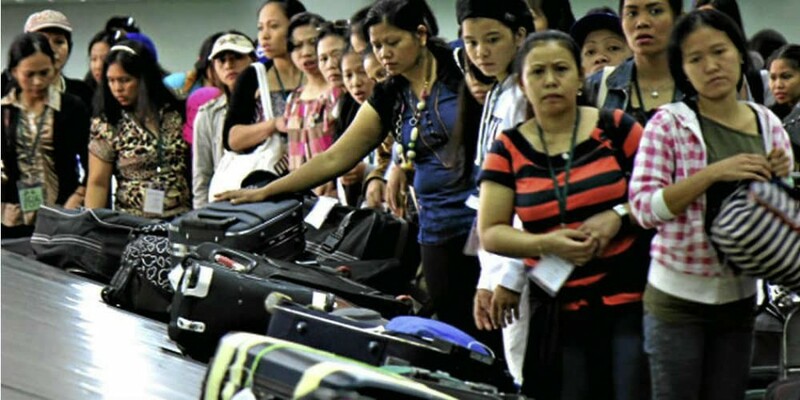 The Philippines Overseas Employment Agency (POEA) notes that in 2010, there were around 4,000 Filipino workers deployed every day. Children of OFWs have no choice but to grow up missing a mom or a dad, sometimes both. How difficult it would be for the youth to be without the love and guidance of their parents? At a young age, they have to understand that a member of the family has to sacrifice life and limb in order for all of them to survive. OFWs have to bear with the harsh winters, the rough seas, the language, religion and cultural differences. Others who are not so lucky have no other option but to surrender to the maltreatment of their employers. Rebelling is far from their minds, lest they be sent home penniless. 1. What is the reason you left your country? The salary in the Philippines is so pathetic. Income taxes are too much, nothing is left of my pay. To send my two brothers through college. 2. How many years did you spend abroad? It is a sad experience to be far from your family. It feels like I am a machine - switch on, switch off. It was scary at first, to be all alone in a far away country. No friends, no family. I had a severe case of homesickness and I worried that maybe nothing would come out of all this. But I had a dream - to buy my own house and car. I have saved enough money to make that dream come true. I miss my family so much. It is a hard life here, but I learned to respect other religions. I want to have enough savings when I come home. I was homesick. I took a long time adjusting to the language, environment, food and culture but with determination, everything worked out well. I am a fighter. I am happy to have learned a new language. I am still adjusting to the food. I decided to work abroad to earn money so that I can buy what I want to buy. It was not a pleasant experience for me. I was assigned to the night shift for three years. My work there had me standing for 8 hours, doing quality check. 4. Do you think working abroad was worth leaving your family and friends? I think I would say it was worth it because my family can now eat better food and we are not poor anymore. After being able to help provide and continuously support my family, give them somewhat a better and a more comfortable life, I guess, yes it's worth it. Working abroad is not worth leaving my family so I decided to go back home immediately after my contract ends. Yes, it is! Admit it or not there is no future awaiting for us in Philippines, the salary is too low, the commodities are expensive etc. I left my country to be able to help and support my family, send my children and siblings to school. Being too far from loved ones is not easy, but nowadays, distance is no longer a burden- thanks to high technology for easy communication. I could say its worth leaving my family and friends because I can afford things I could only dream of before and most importantly, I helped my family a lot. 5. What did you gain from this experience? Emotional strength. Determination. I am focused to work hard and save more so that I can return home. The sooner, the better. I became independent, I learned to manage my own finances, learned to appreciate different cultures and to deal with people from a different race. I discovered countries that I didn't know existed and learned their language, culture and religion. I gained experience on how to manage my time. I learned about the importance of family. Aside from saving money for my future, I learned that the only one who can make our dreams come true is nobody else but ourself. I learned that we can go anywhere to find work but if we do not have hard work and discipline, we will not succeed. This experience taught me that hard work is the best way to reach your dreams. I am lonely to be all alone here but when I know my family back home is happy and contented, I am happy too. I have become stronger. My family is better off now than before. 6. Today, how satisfied are you financially and emotionally? I am financially statisfied. I have purchased a house and lot and a condominium unit. I am able to provide for my families needs. However, I am still not that mature enough emotionally because I miss my family so much. It is true that money cannot buy everything. I am somewhat satisfied. Still need to continue saving and be emotionally strong. After my contract ended, I used all my savings to buy a house for my wife and kids.This experience as an OFW helped me to be more focused and now I can easily get a job locally. I have missed 9 yrs in my kids' lives. It is the most painful time in my entire life, spending Christmas and special occasions alone abroad. But I know that this sacrifice is all for my family. This job I have is assurance that my children will have the education they deserve. I am financially satisfied. Emotionally, I try my best to stay strong. As long as I know that my work will bring food to the table for my family to enjoy, I will survive all hardship. We have a better life now that before I worked as an OFW. We do not worry anymore about money and food. 7. Given the chance, would you still go back to working abroad? If I will be issued a permanent residence visa together with my family, why not? Yes, I would! Life is hard back home in the Philippines. My one month salary here is equivalent to 3 months hard labor in the Philippines. I would just try to ask for a contract extension to have more time to save more money. After that, I'm done. I will not go back to being an OFW. Sure! After Asia, I will apply for work in Europe! Yes, I will still choose to work abroad. I am going to try Canada or US Mainland after my contract here is over. Maybe if that happens, I can take my children with me after a few years. Yes! I would do it again and again for my family and for my future. What can our government leaders do to alleviate the plight of our migrant countrymen? It is a fact that our OFWs helped keep our economy afloat. Their remittances alone bring in billions of dollars every year. What can be done to help them upon their return? Does our government have a fallback program for our modern day heroes? With no future in sight, these modern day heroes once again pack their bags and leave. I am a product of an OFW and I know how it feels when your mom or father left you so they can give you a better life.I worked as an OFW (teacher in Thailand )when I was single, life is different once you are single but I learn so many things working international and being left with my mom so I have a better education- I learnt what is life outside the box and I am thankful and grateful with my parents. When I was in College my plan was to work overseas as well since the job opp there in Pinas is so scarce but the school where I graduated in employed me one semester before I graduated so I never realized my plan, although I am here but I am not working, so. Hayz, I could have answered your questionnaire if only I accepted an offer to work in Singapore way back late 90's. Sana magaling na akong computer Engineer. But that's life. Sayang if only kaya kong iwanan ang family ko in exchange for $. But no regrets, God has a better plan for me pala. I am a satisfied man, content with what I have. Yan, long comment din to compliment this very interesting post. I never dared to go work abroad as OFW because I don't have the guts to go away from my family and work in a foreign land. God had other plan though. He gave me a foreign husband so I quit my job and joined him in the states. I stayed there for almost 6 years then we both came back here in PH and started a ministry for the Lord. Filipinos are a talented lot. It's a pity that some of us have to leave our country to provide a more comfortable life for our families. Family relationships suffer because of this. If only the government can provide decent jobs to our countrymen, then this would not have happened.